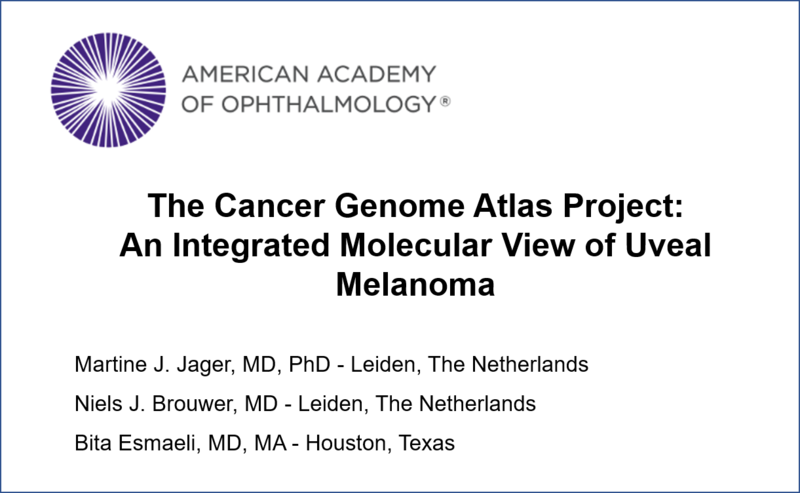 Recently published on Ophthalmology, a paper from one of our partners explains to the Ophthalmology community the breakthroughs that were achieved with the TCGA project. Uveal melanoma (UM) is the most common primary intraocular tumour in adults. Currently, it is possible to obtain excellent local control of the disease. On the other hand, there is no effective treatment for the majority of metastatic UM and up to 50% of patients will suffer from fatal metastases. A wide range of tumour characteristics is associated with the risk of metastases development, being genetic information (the “masterplans” that cells rely on to build their components) one of them. In general, when certain mutations arise in specific genes, they may activate pathways that will set the stage for progression toward cancer. In the case of UM, mutations in the GNAQ or GNA11 genes are considered an initial event in its development. Although expressed in most of UM cases, these mutations are not the single culprit for initiation of oncogenesis (appearance of cancerous cells) process. Additional mutational load (i.e. more genetic changes) are required and will influence a patient’s prognosis. The Cancer Genome Atlas (TCGA) project was set up to study the characteristics of many types of cancers, and recently focused on UM. A vast array of different technologies was used to study genetic and biological information to better understand the formation and different characteristics of UM. Boundaries between prognostication groups differ depending on the technique used, indicating that further investigation is required to allow better understanding of UM’s biology. However, from a clinical standpoint, the information obtained from the TCGA study represents a valuable tool for tailoring patient’s treatment and follow-up. Having better insight into the genetic and immunologic make-up of this malignancy, investigators were able to categorize UM into 4 main groups that differ prognostically. This prognostication method can be used to include high-risk patients in screening programs for early detection of metastasis or in trials for adjuvant treatment – therapies that intend to stop the progression of the disease before clinically identifiable (visible in scans for example) progression has occurred. In summary, these subsets correlate with different outcomes and an increased risk of metastases development, from lower-risk Disomy 3 (the normal status of having two copies of chromosome 3) to higher-risk Monosomy 3 (only one copy of chromosome 3). To learn more about the TCGA project in a digest we did click here. To access the original paper click here.